I’m not one to typically write off a game on this site. In fact I’ve only really done it twice since 2005, once on Test Drive Unlimited 2 for personal reasons and secondly Section 8: Prejudice for my dislike of it’s DRM model (Games for Windows Live). I’m still not going to review TDU2, but I’m taking back, somewhat, what I said about S8: Prejudice. I still dislike GFW:Live, but it’s not enough of a reason to pass on reviewing the game. As such, here’s my full, finished Section 8: Prejudice review. As a single-player, campaign based game, Prejudice fails miserably. The story is hokey, and the encounters aren’t any fun. However few people will buy it for that. You’ll buy this game for it’s multiplayer modes and in that light it’s a surprisingly good buy, especially at $15. The whole ‘launched from a cannon’ respawn mechanic alone makes this game a buzz to play. choosing your landing spot, dodging anti-air cannons and trying to get close to your objectives is fun and the actual decent is a rush. 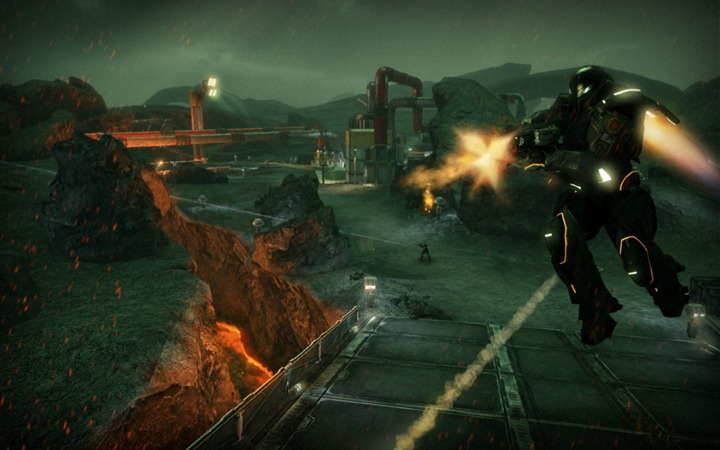 Once on the ground you engage in one of a few different game modes, from Conquest (Battlefield-style capture-and-hold), Assault (similar to Unreal Tournament’s mode of the same name) and Swarm (akin to Gears of War 2’s Horde and Halo Reach’s Firefight). One wrinkle involves earning points during battle that you can spend on turrets and vehicles during battle, which can turn the tide of a fight.Stocking your newly captured control point with turrets is sound defense and a two-legged mech or armored tank can help assault an objective. Dynamic Combat Missions (DCMs) also arise during matching, giving you alternate goals like eliminating an enemy VIP or recovering wreckage. These can lead to mad scrambles as both sides benefit from winning them. Taking and holding an enemy jammer for the predetermined time can be a tense struggle. Weapons and load outs come off as somewhat unimpressive as most guns lack any feeling of power. Different ammo types switches things up with some tearing through shields easier and others damaging armor more but the differences are negligible in my experience. Similar to Call of Duty you can set five pre-set load out configurations to select at any supply depot. Combat struggles from somewhat jumpy targeting and the lack of punch from the armaments that I mentioned. Targeting is resolved by a giant ‘auto-target’ band-aid in the form of a lock-on feature. It seems like such a cheap crutch at first but I find myself using it every chance I get. Points to the devs for making something that works I guess. Visually the game is clean with a sharp look but it almost looks too Halo-y for my tastes. The audio also seems to riff Halo and doesn’t stand out in any way, shape or form. If S8: Prejudice cost $50, I’d say to pass on it in a heartbeat. At fifteen bucks, though, it’s worth your time to give it a shot. If you just want a quick, multiplayer space marine shooter with some unique, if non-game changing features, you may well enjoy your time with Section 8: Prejudice. Pass on a few Big Mac meals and give it a shot. 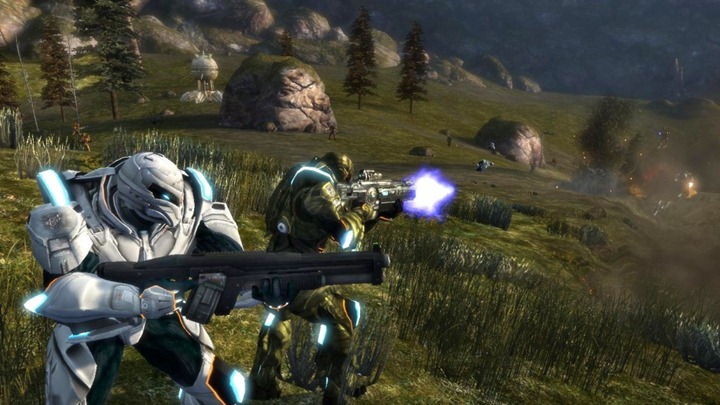 It doesn’t shoot itself in the foot – unless Games for Windows Live is pulling the trigger. In that case, all bets are off.